Thirty-one students from a college in East China's Fujian Province were suspected of being infected with the norovirus. Thirteen students were found vomiting and suffering from diarrhea last week and another 18 students showed similar symptoms on Sunday. After being rushed to a hospital, the doctor found the first batch of students were suspected of being infected with the norovirus, belonging to a kind of intestinal disease, a female employee of the center for disease control of Cangzhou district in Fuzhou, capital of Fujian Province, told the Global Times on Monday. 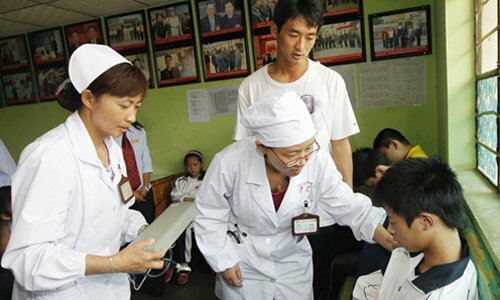 The condition of the students improved after treatment, according to the China News Service, noting that their condition was under control. A male employee of the center for disease control of the district said that they went to investigate the problem after the school had reported the incident. "We went there to manage the cases among students," he said. "The symptoms were light, which can be cured in five days." On the reasons for the infection, the employee did not give a specific explanation, saying that there are many causes to norovirus infection. The China News Service report said the Fuzhou Industrial School, where these students were enrolled in and where the incident occurred, has started inspecting the school's canteen to ensure school food safety, while closely following their students' health.